With a background in environmental policy, campaigning, and media, Marie-Marguerite is passionate about public participation and leveraging powerful storytelling as a tool to engage key audiences in social change. Marie-Marguerite is recognized as a young emerging leader in sustainable development and public participation. 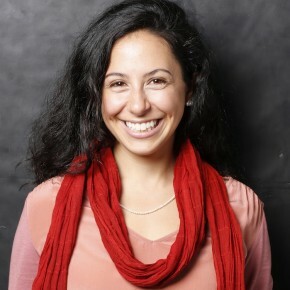 She is the Chief of Staff of Here Now, a strategic communications start-up leveraging peer-driven and mass participatory models to engage new audiences on climate change. Prior to Purpose, she spent years working in international climate policy as an advisor to the Alliance of Small Island States, as a climate officer creating an online sustainable development education program for civil society in the lead up to Rio +20, and organizing Canadian youth at the UNFCCC. In November 2015, Marie-Marguerite was in Paris for the UN Climate Summit, supporting the global climate marches and working with artist Naziha Mestaoui to light the Eiffel Tower with messages of hope and unity. For more than a decade, Marie-Marguerite led a successful acting career, starring in projects with Fox, MGM, and ABC, and directing award-winning theatre. Marie-Marguerite combined her studies in sustainable development and work in the film industry with the aim of establishing an environmental consulting organization for the greening of film and television productions in Montreal and ultimately Canada. Raised in an Egyptian home in Montreal, she has travelled and worked in South Asia, South America, and the Caribbean to work with various local and international organisations, including Child Haven, UNEP and the Bellairs Research Institute in Barbados. Marie-Marguerite holds an MPA in Environmental Science and Policy from Columbia and a First Class Honours BA in Cultural Studies and Development from McGill University. She serves on the board of Leadnow.ca, an independent advocacy organization that runs campaigns on the major issues of our time, engages people in participatory decision-making, and organizes in communities across Canada. In 2008, Marie-Marguerite founded an environmental filmmaking consultancy and toured across Canada as one of the first Canadians trained by Vice President Al Gore as a Climate Reality Leader. Marie-Marguerite combined her studies in sustainable development and work in the film industry with the aim of establishing an environmental consulting organization for the greening of film and television productions in Montreal and ultimately Canada. In October 2008, she participated in the David Suzuki Foundation and Canadian Federation of Students for Sustainability Cross-Canada Tour to promote the greening of campuses. The strong bonds we made as Sauve Fellows will be life-long – and solidified my worldview as one that is solidly global.